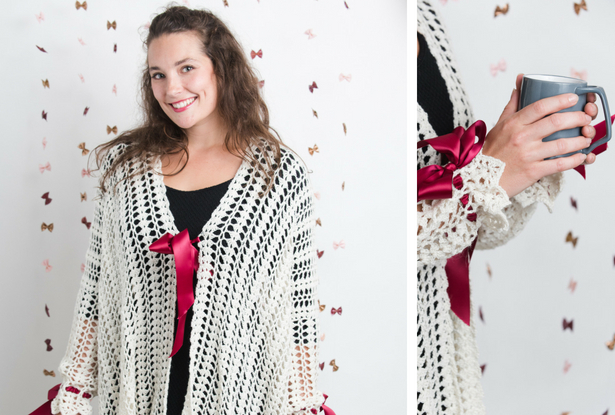 Pair lace and satin ribbon ties with an open-sided, kimono style cardigan for a pattern that’s romantic, light and effortless. 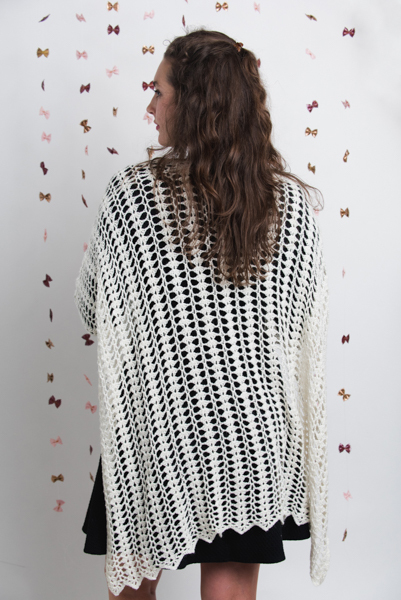 Ideal for first-time garment makers, this project features no shaping but achieves stunning results. Size: Small (Medium/Large, XLarge/2X), 60 (64, 68)” wide from cuff to cuff, 29 (31.5, 32.5)” long from shoulder to hem. Chainless starting double crochet (dcstart): (sc, ch 2) in first st. Loose Slip Stitch (Loose slip st): Insert hook in indicated st or sp, yarn over, pull a lp thru st or sp and lp on hook, do not tighten. 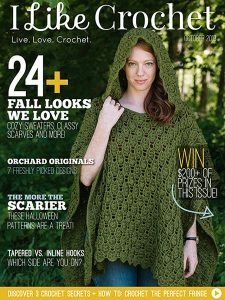 Single Crochet 3 together (sc3tog): Insert hook in first st, yo, pull up a lp, insert hook in 2nd st, yo, pull up a lp, insert hook in 3rd st, yo, pull up a lp, yo pull thru all 4 lps on hook. Garment is worked off a stacked rows foundation. Back panel is then worked off one side of foundation in rows, then front panels are worked in rows off the opposite side of foundation, sleeves are worked in rounds off the outside edges of front panels and back panel. Dc start counts as first dc of each row. Start of sleeves join the front panel to back panel at underarm. Row 2: Ch 3, turn, dc in sc st.
Row 3: Ch 1, turn, sc in dc st.
Row 4: Ch 4, turn, tr in sc st.
Row 5: Ch 1, turn, sc in tr st. Rows 6-71 (79, 87): Rep Rows 4-5. Row 72 (80, 88): Rep Row 2. Row 73 (81, 89): Rep Row 3. Row 2: Turn, dcstart in first st, sk to next ch-2 sp, (Shl in ch-2 sp of next Shl, ch 1, sk to next ch-2 sp, V-st in ch-2 sp of next V-st, ch 1, sk to next ch-2 sp) 17 (19, 21) times, Shl in ch-2 sp of next Shl, sk next sts, dc in top of dcstart. Rows 3-12 (3-16, 3-16): Rep Row 2. Row 14 (18, 18): Ch 3, turn, sk next st, 2 dc in next st, ch 1, sk to next ch-2 sp, (*Shl in ch-2 sp of next Shl, ch 1, sk to next ch-2 sp, V-st in ch-2 sp of next V-st, ch 1*, sk to next ch-2 sp) 17 (19, 21) times; rep from * to * once, sk next 4 sts, 2 dc in last st. Rows 15-47 (19-51, 19-53): Rep Row 14 (18, 18). Row 2: Ch 3, turn, sk first st, 2 dc next st, sk next 3 sts, (Shl in ch-2 sp of next Shl, ch 1, sk to next ch-2 sp, V-st in ch-2 sp of next V-st, ch 1, sk to next ch-2 sp) 7 (8, 9) times, Shl in ch-2 sp of next Shl, sk next 3 sts, dc in top of dcstart. Row 3: Turn, dcstart in first st, sk next 3 sts, (Shl in ch-2 sp of next Shl, ch 1, sk to next ch-2 sp, V-st in ch-2 sp of next V-st, ch 1, sk to next ch-2 sp) 7 (8, 9) times, Shl in ch-2 sp of next Shl, sk to next ch-2 sp, 2 dc in last st. Rows 4-16 (20, 20): Rep Rows 2-3, ending with a Row 2. Row 18 (22, 22): Ch 3, turn, sk first st, 2 dc in next st, ch 1, sk to next ch-2 sp, (Shl in ch-2 sp of next Shl, ch 1, sk to next ch-2 sp, V-st in ch-2 sp of next V-st, ch 1, sk to next ch-2 sp) 7 (8, 9) times, Shl in ch-2 sp of next Shl, sk next 4 sts, 2 dc in last st. Rows 19-51 (23-53, 23-55): Rep Row 18 (22, 22). Row 2: Turn, dcstart in first st, sk 3 sts, (Shl in ch-2 sp of next Shl, ch 1, sk to next ch-2 sp, V-st in ch-2 sp of next V-st, ch 1, sk to next ch-2 sp) 7 (8, 9) times, Shl in ch-2 sp of next Shl, sk next sts, 2 dc in last st.
Row 3: Ch 3, turn, sk first st, 2 dc next st, sk 3 sts, (Shl in ch-2 sp of next Shl, ch 1, sk 5 sts, V-st in ch-2 sp of next V-st, ch 1, sk 5 sts) 7 (8, 9) times, Shl in ch-2 sp of next Shl, sk next 3 sts, dc in top of dcstart. Rep Right Front Panel Rows 18-53 (22-57, 22-59). Turn to work off ends of Rows 1-12 (16, 16) of Back Panel and Rows 1-16 (20, 20) of Front Panels. Rnd 2: Loose sl st in ch-2 sp of first V-st, ch 4, turn, (*sk 5 st/sps, Shl in ch-2 sp of next Shl, ch 1, sk 5 st/sps*, V-st in ch-2 sp of next V-st, ch 1) 6 (8, 8) times; rep from * to * once, dc in last ch-2 sp, ch 2, sl st to 3rd ch of beginning ch-4, completing last V-st.
Rnd 3: Loose sl st in ch-2 sp of first V-st, ch 5, turn, dc in same ch-2 sp (counts as V-st), (*ch 1, sk 5 st/sps, Shl in ch-2 sp of next Shl, ch 1, sk 5 st/sps*, V-st in ch-2 sp of next V-st) 6 (8, 8) times; rep from * to * once, sl st to 3rd ch of beginning ch-5. Rnds 4-19: Rep Rnds 2-3. Rep Right Sleeve Rnds 2 -21. Weave in loose ends. Gently block. 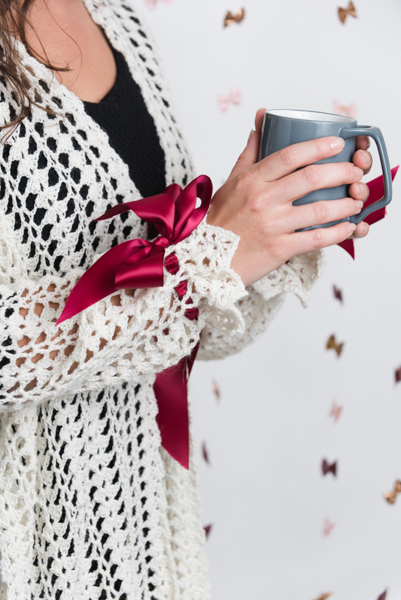 Weave a 32” length of ribbon through the open spaces in Row 17 of each sleeve then tie in a bow to gather sleeves at wrist. Cut ends of ribbon at a diagonal to reduce fraying. Cut 2 lengths of ribbon 18” long, one end straight cut and opposite end diagonal cut. Fold straight cut end toward center to create a narrow end. Insert through edge of 20th Row. Wrap wide ribbon around narrow end and sew in place.